We have all heard the scary statistics about the high obesity rates in American kids, plus schools have cut funding for many PE programs. It is time for us parents to take action and get our kids moving! Running is a great cardiovascular exercise and most of us have the needed equipment (sneakers) to get started. Running also teaches lessons that can be applied to life such as pacing yourself, persistence when things get tough and rewards from accomplishment. I have 2 kids, ages 8 and 10. I’ve also coached track and field and other sports. 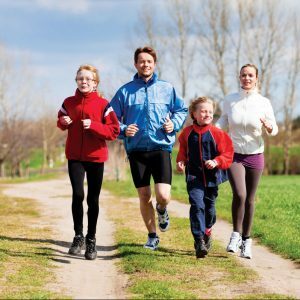 Here are some ways I have found to get kids started running and to help them enjoy it. If your child is out of shape then take it slow to avoid injury plus if it hurts too much they won’t want to do it anymore. Keep it fun so they want to keep at it. Kids are silent (and sometimes not so silent) observers of people around them. Even if your kids don’t seem the slightest bit interested in running, if they see you giving it your all then they will get inspired. Also a side benefit of inspiring your kids to run, it will, in turn, inspire you. When my kids were 2 and 5, I entered into a 5k fun run that just happened to be on my birthday. My kids did the kids run and then I put them in our running stroller for the 5k. My kids were chanting from the stroller along the way “go mommy go!” and singing “happy birthday”. There was no way I was going to walk or even back down from my pace with a cheering squad like that. Have you ever been with a group of kids when they are told they need to run? Most of them say things like “oh, do we have to”, “I hate running” or they fake an injury. Running is hard work, which is probably why it feels so rewarding to complete it. If you want kids to like running and getting exercise then talk about the positives and don’t talk about the aches and pains you get. Some positives to start with are 1) a way to get exercise which is good for your body 2)something to do with each other 3)inspire others to get exercise 4)get fresh air and 5)it feels great to accomplish your goal. Incentives go a long way with kids, especially when they are tangible and immediate. A visual incentive is to provide a punch card for each mile or minute of running. When the punch card is full then provide them a small treat like a ball, paper award or medal. I’m of the opinion that we use junk food too much as an incentive, what is the purpose of teaching your kid to run when you use a piece of candy to do it. Sometimes just saying “good work” is enough. Pinterest has some great templates for awards – Running Awards. A great way to get the whole family involved is to make a family running team. For those family members who want to be a part of the team then buy them matching shirts. If there is a family member who does not want to participate they will see the great team shirts and want to be a part of the action. Younger and older kids love obstacle courses and it is a good way to get the cardio system ready for a dedicated run. When I was a track and field coach, the kids would complain about running until one day I set up an obstacle course, hula hoops for each step, cones to zigzag through, pieces of wood to jump over, etc. The kids loved it. For obstacle course ideas, check out Pinterest. For older kids, Indian Runs are a great way to break up a run. You will need at least 2 people but it is better to have at least 4. Run in a single file line, when the last person calls an agreed word then that person runs faster passing the line of runners until they are at the front of the line and the new leader. Each leader stays as the leader for approximately a minute. This is a great way to get a kick to your cardio system too. For younger kids, count the number of things you see, such as the number of birds, blue cars, etc while running. It will help distract them. For any age, set a tangible goal such as “see if you can run from here to the mailboxes”. Also racing your kid or finding another kid they can race will help invigorate them. Or use a stopwatch so they race against the clock. Most kids love to be with other kids so look for opportunities to run with others. It is a great way for kids to support each other, especially if they are of similar running level and age. Go running in the forest. It adds more excitement and interest if you have to jump over logs, duck to miss branches, leap over streams and kids LOVE it! Kid’s instincts are to start a run at their fastest speed but then they run out of energy quickly. Teach them how to pace themselves. Start off slower and save energy for the end, where the race is won. Avoid eating at least one hour before you run and only drink small amounts of water. Back down the pace and breathe in through your nose and out through your mouth. It is natural to tighten your stomach muscles when you start to run, so see if you can talk them through relaxing those muscles. If none of that works then try walking it out. It may take some practice to avoid cramps. When I started running in my 20’s I experienced horrible cramps within 10 minutes. Every time I ran they got progressively better and now it is very rare I experience them. 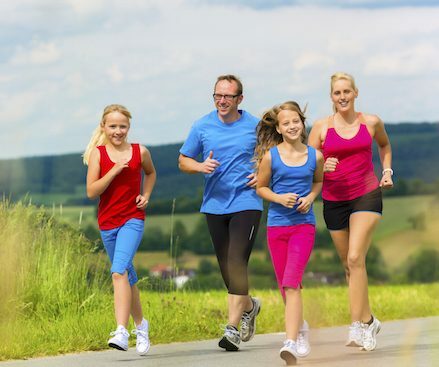 Buy your kids a small notebook where they can keep track of every run, including date, time, distance or amount of time they ran, and other notes such as how long they could run without walking. You could also turn it into a science experiment. Make observations about modifying their stride and how it changes the ease of running. Or what they ate the day before and how it affects their energy levels. A journal is also a good way for them to see progress and to set goals for the next run. Be careful to not be too critical, remember they are kids and the more fun they have the more they will want to do it again. Ensure to schedule times to go running. I block it out on my calendar. Be sure to also have days of rest. Runners World magazine has a great section about kids running, https://www.runnersworld.com/kids-running. Pocatello marathon offers races for every level and age including a .5 fun run for kids, 1-mile family run, 5k (good for a middle school to beginner high school students), 10k for the more serious high school students.